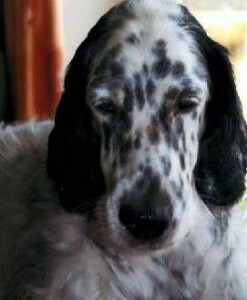 From the first time we saw Poppy’s first litter we fell in love with the English Setters. On our second visit there was one puppy who took a liking to Derek’s shoe laces and my earrings – yes it was Pip. He was a normal setter puppy liked to chew things he wasn’t supposed to. I took him to puppy training classes – and on the whole he was very good, apart from when we had to walk home across a bridge! He put his anchors on a refused to walk across – this also happened when we walked under a bridge – we had to walk a couple of extra miles to avoid the bridge as he was too heavy to carry. He certainly was a character. We were stopped on numerous occasions and told what a handsome dog we had – we knew already of course he had a lot of his mum’s characteristics, which was lovely. Stephen – our son – had a great affinity with Pip – although he didn’t live with us he walked him and looked after him when we went away – which we were when Pip passed away. Stephen and his wife Rachel were unbelievable towers of strength during Pip’s illness and his stay in hospital. We can never thank them enough for all they did. Our twin grandsons also loved Pip and were absolutely devastated – as we all were – when he died. We cannot thank Maud – his breeder – enough for all the help and support she gave us from beginning to end of Pippin’s life. She is a remarkable woman. 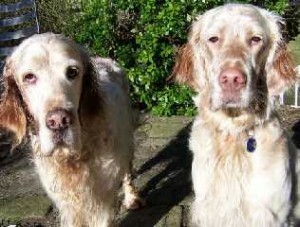 The lovely Suzy went to live with Alan, an experienced dog owner, and his gorgeous Golden Retriever, Charlie. Charlie was all set to train Suzy in the ways of her new household when he sadly died. Suzy quickly gave all her love and passion to Alan and made his life a nightmare demanding attention and doing naughty things to make sure he didnt forget she was there. 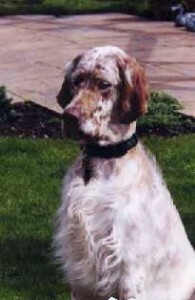 Poor Alan’s life was made extremely difficult but admirably he persevered with Suzy and now, with the help of Harvey, a rescued Cocker Spaniel, she is a credit to both of them. Emyline with her big sister Tess. Emy was born in July 2007. Her mum is Sapphire (Pewterspeare Paeony) and her father is Ashley (Richecca Dark N Gold). Emy is very sociable and kisses everybody including Tess, the cows in the field next door and all the delivery men who come to the house. She spent 5 months in France when she was a puppy and impressed the locals as she used to “sit” and “come” in response commands in French. Like all Maud’s dogs no doubt, she is obviously brainy as well as beautiful. 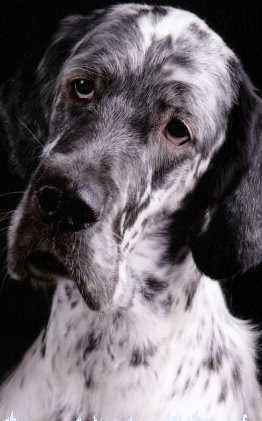 I have owned English Setters now for over 12 years. My first English, 5 year old Pearl, was a superb ambassador and introduction to a breed which was to steal my heart. Then came Daisy-May both thesegirls were much loved family pets. I then purchased my first boy Oscar, with a view to taking up a new hobby. I had a hankering to take up showing this beautiful breed. My children were of an age that they had their own interests and now, well, now is time for me. I did a few shows with him but sadly he really wasn’t of show quality, so he’s resigned disgracefully to the sofa and a life of luxury and leisure, he doesn’t seem to mind!! 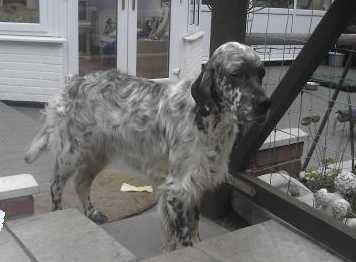 I had taken Oscar to Helen Cooper-Jones, to help me trim him in “show style”. It was Helen who told me of Maud Leather’s impending litter. The breed lines were very interesting (including incredibly a distant connection to my first dog Pearl). Helen offered to help me choose a puppy of show quality. On meeting Maud, you cannot fail to instantly warm to this kind, quiet lady. She agreed to let me have the pick of her litter for showing. When the time came, Helen and Maud had many a debate, as the puppies were of excellent quality, but we finally got down to two. I had insisted I wanted a boy, colour was not so important, movement, good bone and a quality head were. The choice was made and Pewterspeare Pure Genius, or Guinness as he is known, came home with me. I cannot praise Maud enough For the amazing package of information I received on collecting him, pedigree, insurance, bedding and food samples. This puppy unmistakably came from a breeder who loves her dogs first and foremost, the well being of the puppy was top of her agenda and she has continued to assist and support me. In the show ring, well for novices we have certainly had some fun. 8 championship shows and 8 places in the first 3! That’s 8 Crufts qualifications, he’s taken to showing with great enthusiasm and enjoys all the trimming, bathing etc he even jumps in the bath which is a great help. We had our 1st win at the Northern English Setter Show in December, sadly Maud missed it, but I telephoned her straight away. I hope you enjoy these pictures of “our” gorgeous boy. A wonderful start to showing and the most affectionate dog I’ve owned to date, well done to his breeder for being so clever. We bought our beautiful English Setter from Maud in 1999. We call her Saffron – her kennel name is Pewterspeare Painted Quail. 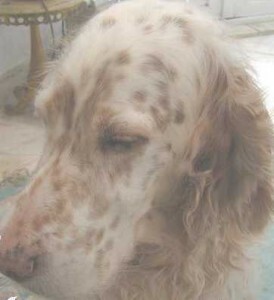 We love her dearly and she has made our family complete she is a real character – very gentle and loving. She is the most affectionate faithful and loveable dog but I suppose that is typical in the breed. She follows me round the house from room to room like my shadow and has brought much joy to all of the family. She loves her toys and can be regularly seen carrying her life like stuffed Yorkshire Terrier toy (this is her favourite she also has a squirrel and rabbit) sometimes I think she thinks it is real as she washes and grooms it – really quite funny. My dream is coming true, we now have four amazing boys, one of whom is Pugwash. He was last in, so to speak but from day one made his presence known. He is a confident individual who knows who he is and wants everyone else to! Not typically he comes back when he is called, and always have, with the ‘waggiest’ tail I have ever known, just call his name and he can hardly walk with his back end almost reaching his front! Pugwash insists on company preferably his ‘brothers’ with whom he loves to play with endless energy. Very mischievous, (must be following his granny), he’s the one who’s sent to his bed most often but a second later he’s happy again. To sum up Pugwash, he is a strong, brave and eternally happy dog who wears his ‘heart on his sleeve’ and we love him dearly.